Gulf States Engineering Co., Inc. is an equipment distributor and manufacturer's representative serving municipal and industrial markets in Louisiana, Mississippi, Arkansas and Western Tennessee. Since 1967, Gulf States Engineering Co., Inc has served the municipal and industrial marketplace with rotating equipment solutions and service. In the early 1980’s Gulf States Engineering expanded into water and wastewater treatment process equipment to meet the growing demand for high quality water and a cleaner environment. Industry leading equipment manufacturers combined with our application knowledge and experience yields answers to your worst problems. The company continues to grow with an expansion into Tennessee and Arkansas in 2002. Application engineers and field sales personnel stand ready to assist with proper selection/implementation of new or replacement equipment through design assistance, specification development, field consulting, and startup commissioning. Our staff engineers can assist with upgrading replacement equipment better suited for the job than like kind replacement. General equipment categories offered include pumps, blowers, compressors, valves, water treatment, wastewater treatment, sludge dewatering and controls/monitoring. Factory Authorized Service Facilities are strategically positioned in five geographic locations to serve you. 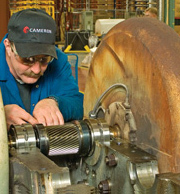 Shop and field service technicians are factory trained and certified by the manufacturers that we represent. Field service technicians are drug tested, safety trained, and equipped to work in virtually any facility.